The EF1000iS is the lightest generator in its class at only 12.7kg and will run continuously for up to 12 hours without refuelling (at 1/4 load with Eco On). ... smaller, lighter, quieter and out performs the competition! An inverter system stabilizes the amount of voltage and frequency produced by a petrol engine driven alternator through the supply of "sine wave" electricity, with a distortion ratio of less than 3%. 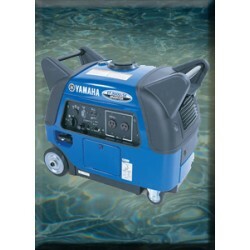 That's why Yamaha Inverters are the ideal power source when using precision equipment or micro-computer controlled electrical appliances. Yamaha's Inverter system produces AC current within a controlled electrical circuit process, known as PWM (Pulse Width Modulation). As a result, fluctuations in engine speed do not affect the voltage or frequency of the electrical output while at the same time reducing output emissions. The adoption of a multi-polar alternator enables the generation of more efficient, high frequency 3-phase AC current that the inverter than turns into single phase. The high efficiency alternators on a Yamaha Inverter achieve a much lighter and more compact generating unit than conventional 2-pole rotor type alternators. Yamaha's Smart throttle feature automatically adjusts the engine speed to precisely match the energy load. This means much quieter, more efficient engines that run and last longer. Yamaha's Noise Block feature, an acoustically engineered sound reduction system , utilises various sound absorbing materials, moulded cases, an intake silencer, fibreglass insulation, plus newly designed mufflers and fans to provide virtually silent running while maintaining the highest quality performance. 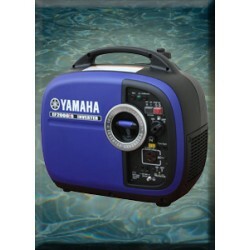 At the heart of every generator is a strong Yamaha engine that delivers powerful and consistent performance, that's so quiet you'll forget its running. 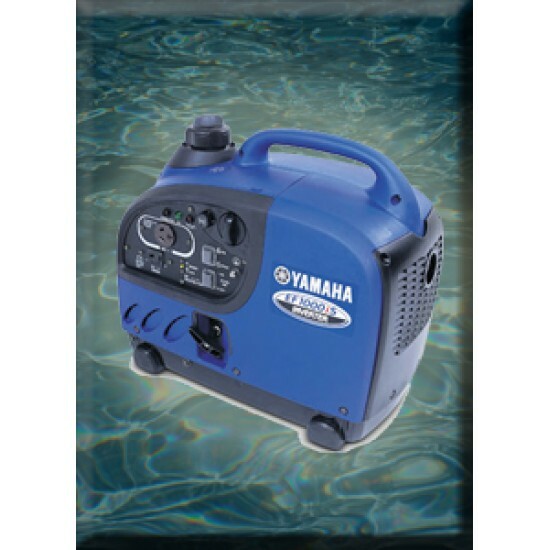 Every generator includes an approved spark arrestor and a low oil shut-off system for long life and added peace of mind. 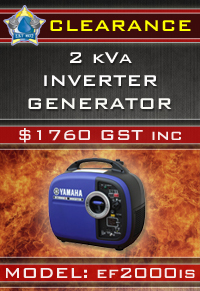 Newly designed exterior and compact, lightweight, inverter unit reduces weight to 12.7kgs. Lightest weight generator in its class. Inverter system with Pulse Width Modulation (PWM) control. Industry leading system produces higher-quality and cleaner electricity. Results in pure sine wave as clean or cleaner than commercial power and can operate products with built-in microcomputers. Noise Block. Acoustically designed sound reduction system. Moulded casing, noise-absorbing glass wool construction and a newly designed muffler produce unbeatable noise reduction. Runs continuously for up to 12 hours without refueling (at 1/4 load with "Economy Control" function on). Load sensing throttle control. Automatically adjusts engine speed to precisely match load, resulting in greater fuel efficiency and noise reduction. 12 Volt DC Output (Battery Charging Cables Included). Recharge 12 volt batteries for RV, auto, marine, aircraft. Exclusive Dual Coil Alternator Stator. Lower engine speed. Reduced noise, fuel consumption and engine wear. Control panel enables easy access to controls. Reduces carburettor contamination by turning off petrol flow and allowing the carburettor to run dry. OHV 50cc Engine (overhead valve). Provides improved efficiency, increased reliability, low oil consumption and noise-reducing operation. Wide mouth fuel fill reduces spilling and overflow during refueling. Peace of mind with full support. *For personal or recreational purposes. 12 months from date of original purchase for professional or commercial use. 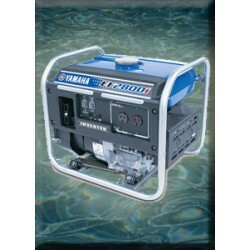 2 kVA petrol powered inverter generator MODEL NO. EF2000iS Specifications ..
2.8 kVA petrol powered inverter generator MODEL NO. EF2800i ..
3 kVA petrol powered inverter generator MODEL NO. EF3000iSE ..